What compensation can you recover in Florida for your injuries and what do you need to prove to get your hotel injury claim paid? Throughout the year, couples, families, and retirees alike travel to South Florida to enjoy the beach, cosmopolitan nightlife, and/or our world renown gourmet restaurants located in Broward, Miami-Dade, and Palm Beach County. Florida is the top travel destination in the world, which means there are an abundance of hotels here. In fact, in 2011 records show the State of Florida had over 370,000 hotel rooms — and more hotel rooms are being built here all of the time. 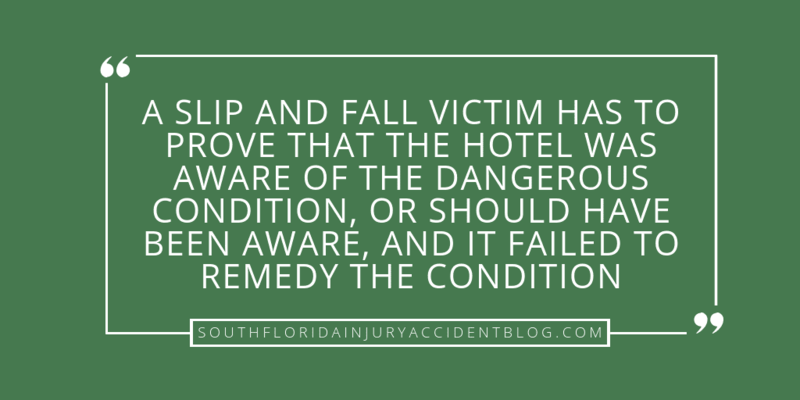 As a guest in a Florida hotel, you expect the hotel will take all reasonably necessary steps to keep you safe – but what happens if the hotel fails to do so and you are hurt in your shower or bathroom from a fall? Florida’s premises liability law allows victims to recover compensation for their injuries. The State of Florida, as well as the hotel industry, have a strong financial incentive to want to keep guests safe and they expect their hotel operators will take steps to do so. That’s why if a victim can show (prove) that the hotel was negligent, then Florida law allows a victim to recover damages related to medical bills, lost wages, pain and suffering, scarring and disfigurement, and other economic and non-economic damages. However, in order to prevail victims have the obligation to prove the hotel is responsible for their injuries. Pursuant to Florida Statute 768.0755, as well as case law, an injured party must show that their hotel was aware of the dangerous condition (actual knowledge), or should have been aware of it (constructive knowledge), and that the hotel failed to remedy the condition. These are not easy requirements to satisfy, considering that the victim got hurt in a private hotel bathroom, but it can be done as shown by the cases below (as well as the hotel shower slip and fall case we recently settled for a client for $75,000.00). In Cooper Hotel Services, Inc. v. MacFarland, Mrs. MacFarland slipped and fell while taking a shower in the bathroom located in her hotel room. After she was unable to settle her damage claim with the hotel, she filed a lawsuit against the hotel based upon Florida’s premises liability law. Under that law, she had a duty to prove with admissible evidence that the hotel had been negligent, and therefore had breached its duty of care to her. Proving that negligence caused Mrs. MacFarland’s to fall was difficult to do, given that she had fallen in the tub while the water was running and she was alone at the time. The tub she fell in was one of the common shower-bathtub combos, and, according to the court, there were many ways for her to show that the hotel’s negligence caused her to fall. For example, had she shown that the hotel’s failure to properly maintain the tub made it dangerous, she would have met her burden of proof. However, even though her damage award was reversed the case is still helpful to slip and fall victims because it provides and outlines how someone hurt in a fall, alone in a hotel shower or bathtub, can prove their case. It also makes it clear that Florida hotels need to provide rooms with safe and secure showers and baths because of the high risk of falls from slippery floors. That the hotel failed to warn the guest of this concealed peril of which it knew or should have known. Mrs. Rubey’s argument that it was not reasonable for a guest to be on the alert for a rolled up rug to be left on the bathroom floor, and that by not having that rug lying flat caused a dangerous condition for which the hotel was responsible. The court agreed with her. An important fact in the case is that she would have had to cross the room in order to turn on the overhead bathroom light. The light switch was on the other side of the room from the entrance with the rolled up bath rug between her and that switch. How Difficult Are Florida Hotel Bathroom Slip and Fall Cases to Win? Most Florida hotel rooms are safe and well maintained and most owners use their best efforts to keep things that way. However, when someone is hurt in a fall in a Florida hotel or motel shower, the injured party can expect a vigorous defense by the property owner and their insurance company. This is why it is important to gather evidence as soon as possible after a fall and demand that the hotel preserve any evidence of the accident. Equally important is understanding how the hotel industry works and being aware of the laws and regulations that apply to the hospitality industry. For example, is there a local ordinance that requires all hotels to provide a slip resistant bath mat or require the hotel tub or shower to be treated with anti-slip materials or have grab bars or other fall prevention devices? Knowing how to gather evidence and how to make demands on a hotel (and knowing which experts to hire and which economic and non-economic damages to seek) can be the difference between winning and losing a case. Hotel bathroom slip and fall cases are not the easiest cases to win, especially those against a well funded hotel, but this does not mean that justice should not and will not prevail. Will A Victim Have To Come Back To Florida To Pursue His Or Her Claim? Most personal injury claims are settled without the need to file a lawsuit and without the need for the victim to return to Florida. (95% of all personal injury claims settle). This fact applies to hotel shower and bath slip and fall claims. However, if the claim is not settled and a lawsuit is filed, then the victim may have to come back to Florida between 1-3 times. The number of times depends on if the case goes to trial, which doesn’t happen very often (5% of personal injury cases got to trial). If a lawsuit if filed, the first time a victim may have to return to Florida is if the defense wants to take the victim’s deposition. The good news here is that most depositions only last a few hours. Which means, the victim will only have to return to Florida for a day. Another event that may require a victim to return to Florida is if their is a mediation. Again, there is good news and that is in many situations the victim may be able to appear at the mediation by telephone. The third most likely time a victim will have to return is if the case goes to trial, which is one of the most unlikey outcomes for a personal injury lawsuit. The bottom line here, is almost all personal injury cases are settled, which means it is unlikley a victim will be required to return to Florida to get compensation, but it can happen. What Other Steps Should A Hotel Take To Avoid Guests Falling And Getting Hurt In Their Room’s Bathtub Or Shower? Insurance companies that write policies for hotels create risk manuals and risk assessments that target slip and fall accidents for specific locations, including hotel bathtubs and and hotel showers. See, for example, the Traveler’s Risk Control – Evaluation Guide. If you or a loved one has been involved in a slip and fall accident in a Florida hotel bathtub or shower, then you may be interested in evaluating that accident from the insurance carrier’s perspective. Was there a separate shower and bathtub? Separate showers and tubs may be arguably safer than a combination unit. What was the lighting like in the bathroom? Visibility should be a given in any hotel room where the guest isn’t used to maneuvering around in the middle of the night. Was any light bulb not working in the hotel bathroom at the time of the accident? Not making sure that all the lights were functioning might be a contributing cause of the fall. What was the floor of the bathroom like? Was it a slippery surface? A slippery surface may mean that the hotel was negligent. Did it have carpeting? Were there rugs to help give the guest’s feet traction? The floors should be safe and secure to walk across for any guest. Did the hotel provide guests with a introduction into the bathroom’s amenities (including how the tub jets work, etc.) when the guest was first taken to the room? It’s not just working for a tip; the hotel staff need to help guests understand how things in the guest room operate. Did the hotel provide soap and shampoo in the guest bathroom? Did they carry any warning labels? Shampoos and conditioners on the floor are slip and fall accidents waiting to happen. Did the bottles remind you of this risk? Were there any signs giving instructions or warnings in the hotel room or in the bathroom? Warnings are there for a reason; sometimes, they are a hint that there were similar accidents there in the past. In the shower, were the floors slippery? A slippery surface may mean that the hotel was negligent. If so, was the shower floor made of a material that was slip-resistant? It should be. If so, was the shower floor cleaned and clear of mold, fungus, mildew, or other slippery conditions? Bad housekeeping can be the cause of a hotel bathroom slip and fall accident. Did the shower have a bench? These are provided as an extra safety feature, and the hotel may argue that failure to use the shower seat is a contributing factor to the fall. Was there a slip-resistant mat in the shower? Are these mats provided in other rooms of the hotel? A missing mat or a worn mat can be a basis of a negligence action. If so, then what was the mat’s material? Was it made of rubber? Did it have holes to allow drainage? Was it clean from soap film? Was there a handrail in the shower? If not, why not? Was there a grab bar in the shower? If not, why not? Were there curbs around the shower stall? If so, could they be easily seen? If the curbs around the shower stall weren’t easily seen, would painting them a different color have helped? Did the fall happen in the bathtub? If so, was there slip-resistance material on the bathtub? Was there a grab bar for the bathtub? Was the design of the tub unique, making it difficult to climb in and out? Was the tub clean of mildew, mold, soap scum, bubble bath film? What is the cleaning schedule for this hotel room? Who was responsible for cleaning the room on the date of the fall accident? Have they been reprimanded in the past for not doing a good job? How much experience in housekeeping do they have? How much training has the hotel given them on the importance of keeping showers and bathtubs safe from accidents? Is there a hotel management log that tracks cleaning and mopping of the hotel rooms? What does it report about the room where the accident happened? Did a part malfunction in the accident? Did a shower head fall off, startling or burning the guest? Did the tub’s grab bar fail? Did a tile in the floor of the shower or outside the bathtub come loose? If so, was the hotel or a member of its staff aware of this problem before the accident occurred? Has the product manufacturer had other claims regarding failure of this product? Has the contractor who installed the part in the bathtub or shower been the subject of other claims for product failure? What is the history of hotel guests having accidents in their hotel rooms at this hotel? What is the history of this hotel chain having slip and fall accidents in their guest room bathtubs or showers? If a third party cleaning service company is used, then what is the company’s history of having slip and fall accidents in the locations where they clean? If there is a service that inspects the hotel’s guest rooms, then when was the last inspection done and what was reported for the place where the slip and fall occurred? A victim show use these questions against a hotel and gain leverage to get a settlement. Remember, these questions were taken directly from an insurance company manual. They are the recommended steps or procedures a hotel should take to minimize the risk of an injury. If the hotel doesn’t follow those recommendations, then why didn’t it do so? A good piece of advice if you have been harmed by a slip and fall in your hotel shower or bathroom, is to speak with an experienced personal injury lawyer before you file a claim to learn about some of the issues that can arise with these claims, including how most insurance companies respond to these claims and the type and amount of damages you can recover. Most personal injury lawyers, like Alan Sackrin, will offer a free initial consultation (over the phone or in person) to answer your questions. While staying at Orange Lake Resort in florida my best friend fell down in the bathroom in our suite. After going to the ER the next day because the pain was so bad he found out that he had 3 fractured verterbraies in his back. The water on our suite floor was coming from the unit above us and dripping down like crazy. I have plenty of photos of the dripping water from the unit above. It was dripping from the vent fan all over the bathroom floor and toliet tank. This injury happened 5 minutes after entering the room.Ruined the whole vacation. I’m from Chicago and he’s from NY. I was hoping to get a few questions answered. #1- Does he need a Florida lawyer or a NY lawyer? #2- Does he have a great case? #3- What would something like this pay out? #4 Why wouldn’t the hotel comp our 3 night stay for this type of injury? Please use email as a way to get a hold of me. ps: The room was in my name not his. Why wouldn’t they comp me for the stay they did nothing but offer us a voucher for $100 dining at the resort so we could order dinner for our room. All weekend they were fixing the unit above us. Major water leak issues.